During storage, headspace conditions play an important role in affecting the physical, chemical, and biological activities of living organisms in the upper layer of a grain mass. A model was developed using energy and mass balance principles to predict temperature and relative humidity of the headspace air in a partially filled silo. 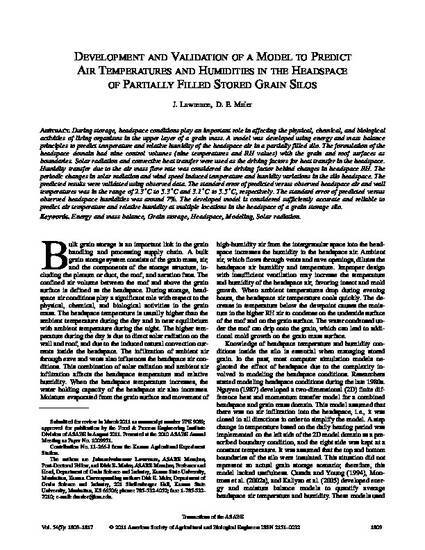 The formulation of the headspace domain had nine control volumes (nine temperatures and RH values) with the grain and roof surfaces as boundaries. Solar radiation and convective heat transfer were used as the driving factors for heat transfer in the headspace. Humidity transfer due to the air mass flow rate was considered the driving factor behind changes in headspace RH. The periodic changes in solar radiation and wind speed induced temperature and humidity variations in the silo headspace. The predicted results were validated using observed data. The standard error of predicted versus observed headspace air and wall temperatures was in the range of 2.3°C to 5.3°C and 3.1°C to 5.5°C, respectively. The standard error of predicted versus observed headspace humidities was around 7%. The developed model is considered sufficiently accurate and reliable to predict air temperature and relative humidity at multiple locations in the headspace of a grain storage silo. Copyright 2011 American Society of Agricultural and Biological Engineers. Used with permission.